This is a really unique cake made with semolina and almond meal making the texture quite a contrast to cakes made of regular flour. 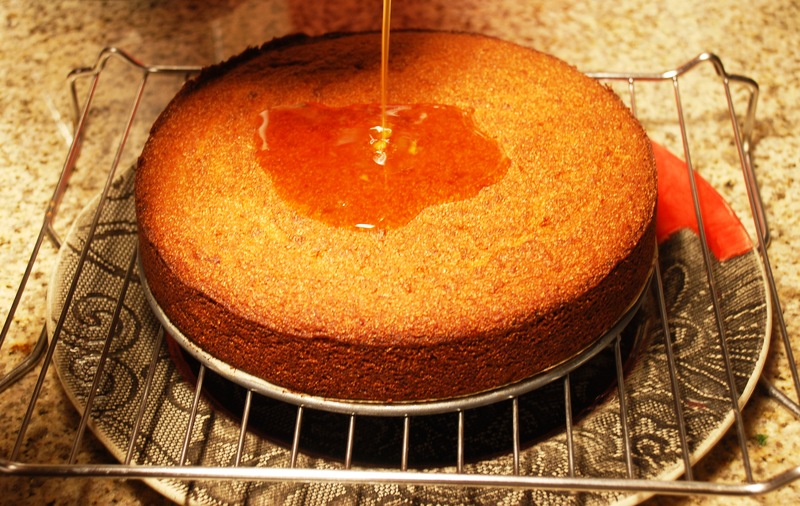 The orange honey syrup gets soaked in and really makes it moist and perfect. The orange blended and pureed and mixed into the batter with the pith and everything makes it really zingy. It is just so different to any other cake I made before. And oh, did I mention that it tastes totally fantastic!! This cake just looked so glorious in the picture in Delia’s How to Cook, Book three and made me think of my Greek summer holiday. I also keep up my stocks of Greek honey shipped in all the from Greece, courtesy of Amazon, ever since I have tasted the stuff. So drooling over the book I decided, I just had to give this recipe a go! This cake would even be fantastic if you leave the yogurt topping off. I know this because as I left it out to cool overnight and let it soak up the syrup only to discover in the morning after unwrapping the foil around it that a slice had gone missing from my beautiful whole cake! My sneaky husband had clearly been lurking about the kitchen for a midnight treat and helped himself to nice piece under the cover of night, before I got the chance to ice it!!! 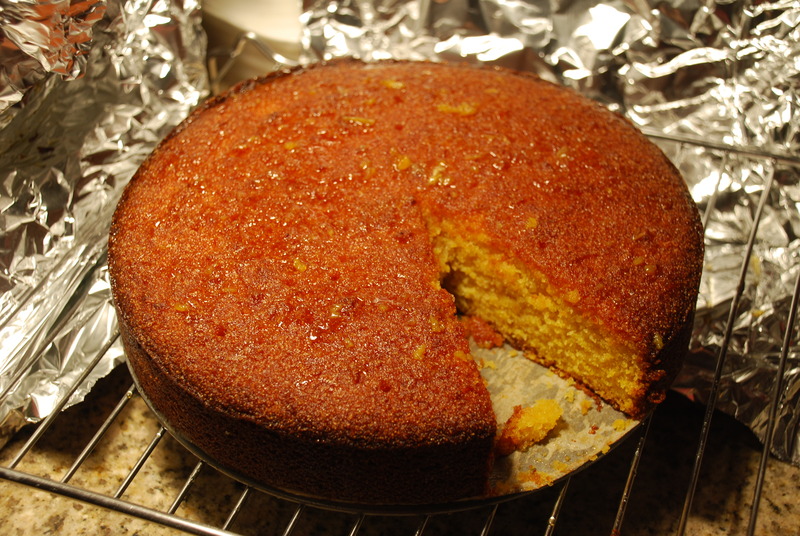 Anyhow, thank god for the cake thief, cause now I know the orange and honey syrup alone makes it taste glorious enough that next time I make it I will not ice it unless I had people coming over and wanted it to have more of a wow factor, for home baking it is divine with out it. So give it a go! First, cut the oranges into chunks, removing the pips. 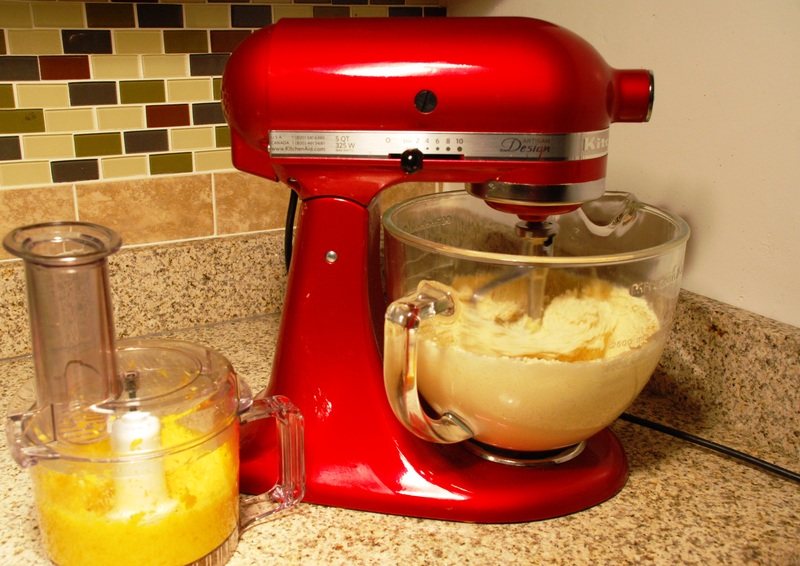 Then tip the whole lot – flesh, pith and zest – into a food processor and whiz it to a thick puree. 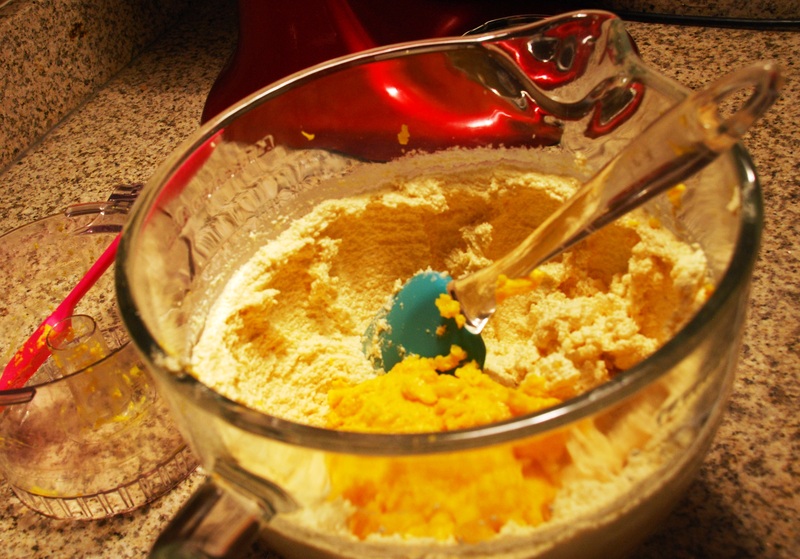 Next, put all the other cake ingredients into a large bowl and, provided the butter is really soft, just go in with an electric hand whisk and whisk everything together until you have a smooth, well-combined mixture. 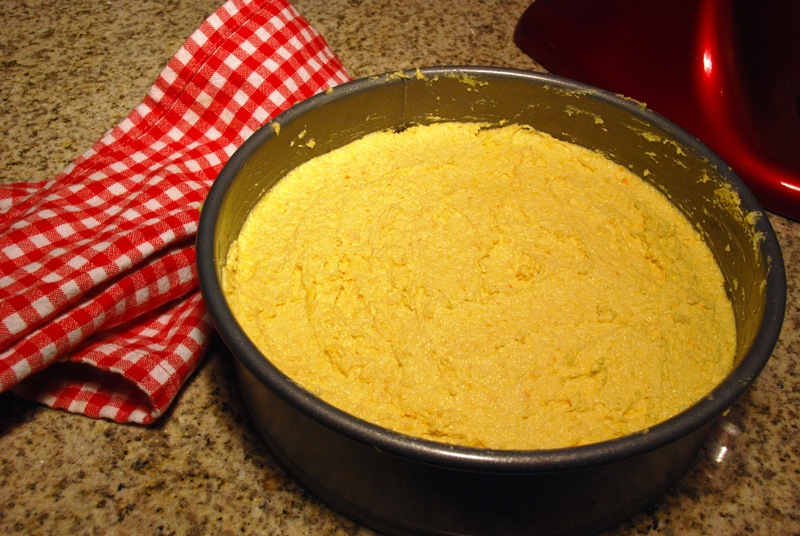 When combined, fold in the orange puree, spoon the mixture into a prepared 10 inch springform tin and smooth the top with the back of the spoon. Now place the cake on the center shelf of the oven and bake it for an initial 10 minutes. Then lower the temperature to gas mark 4, 350°F (180°C) and bake for a further 40-45 minutes, or until it is golden brown, springy in the center and has shrunk slightly from the sides of the tin. Meanwhile, make the syrup. To do this, simply combine the honey and 5 tablespoons water with the cinnamon stick in a small saucepan, place it over a gentle heat, bring it up to simmering point and let it simmer gently for about 5 minutes. After that, take the pan off the heat, remove the cinnamon stick and stir in the orange and lemon juices. Leave the cake aside to cool for 5 minutes, then remove it from the tin to a wire rack to cool, with a large plate underneath. Make a few holes all over it with a skewer before pouring the syrup over it. (It will look like there is far too much, but don’t worry, the cake will absorb more than you think, and any that is not absorbed can be poured from the plate back over the cake.) Then, when the cake is absolutely cold, place it on a serving plate, cover it and leave it in a cool place overnight. 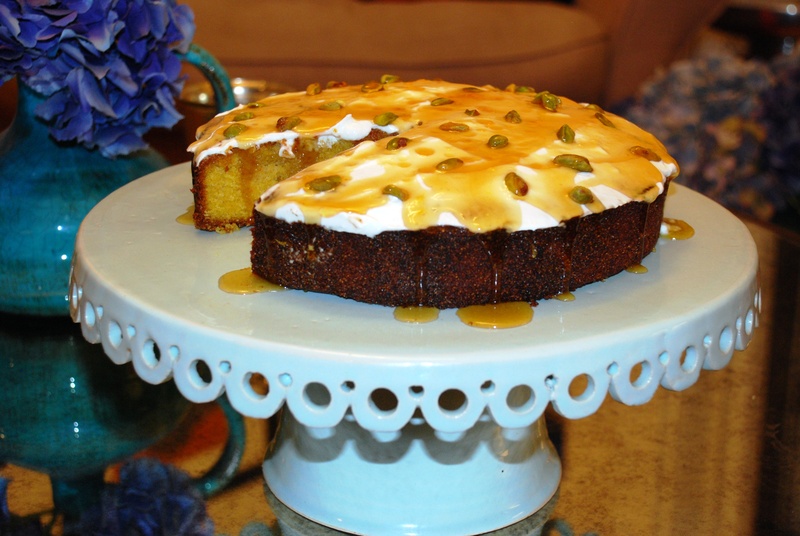 Just before serving, spread the top of the cake with the Greek yogurt, sprinkle over the pistachios, drizzle with the honey and serve cut into chunky slices.